Paramount, CA – Paramount High School senior Anita Okogbue took a stand against bullying alongside fellow students when she attended a workshop on the topic of self-worth and confidence at the second annual Paramount Unified Young Women’s Empowerment Conference on Nov. 3. 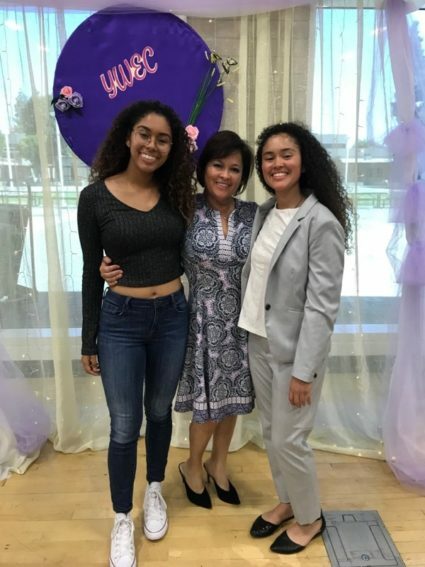 Okogbue, the Black Student Union president at PHS, was among more than 200 female students who learned about self-worth, confidence and just how harmful bullying can be to a young woman’s self-esteem from presentations given by guest speakers, such as Los Angeles Superior Court judge Connie R. Quinones. FBI Special Agent Evette Rivera and PHS language arts teacher Christine Barboza also presented. The day’s workshops explored topics like healthy relationships, money management, cyber bullying and first-generation challenges. “During the confidence workshop with Christine Barboza, she asked girls to stand up if they had ever been bullied or cyber-bullied and, while I consider myself to be a very confident person, an energetic person, to see the girls all stand up one by one and say ‘yes, I have been bullied,’ it was a slap of reality because you just don’t know those things are happening otherwise,” Okogbue said. Barboza, who has taught for 27 years, spoke about being the first in her family to graduate from college. Okogbue said Hubbard took time after the conference to speak with her and has been helping her to connect with representatives from colleges like UCLA and Cal State Long Beach. Okogbue said that she doesn’t have a dream college, but definitely plans on pursuing a degree in nursing wherever she ends up. The day’s event also included dance routines performed by the Pacific Islander Club, the Black Student Union and the PHS Cheer Squad. Breakfast and lunch were served.